John Kerry –connecting again with yet another audience. ADL is a largely Jewish organization, which is not likely to recognize John Kerry’s “commandment” as one of the big 10. Sloppy sentence, Hugh. You know and I know that the Big 10 are found in the book of Exodus, which features the little-known story of the Hebrews fleeing from Egypt. Some of the people in the Anti-Defamation League might have heard that story sometime. So it’s not that the members of the Jewish organization won’t recognize the ten commandments. A more nuanced reading indicates that the members of the Anti-Defamation League will not recognize Kerry’s “Love your neighbor” edict as one of the ten commandments because it’s not in the ten commandments, not because the Jews don’t recognize the ten commandments. Looking to go swimming at a St. Louis County park pool on Memorial Day or Labor Day? After voters this month narrowly turned down a sales tax increase to support county parks, the parks department is trimming five weeks off the swimming season. Obviously, not forking over an extra sixteen and a half million dollars of our money every year has forced the county to prioritize its budget and trim some non-essential services. Unfortunately, this will infringe upon the pencilled-in right to swim found in the elaborately customized constitutions owned by the St. Louis Post-Dispatch. Undoubtedly, this will impact the children, the seniors, and the poor disproportionately, as they don’t have swimming pools in their backyards. I guess we’ll read that in tomorrow’s Post-Dispatch. Four hockey fans are mountain climbing. Each climber happens to be a rabid fan of a different NHL team. One from Chicago, one from St. Louis, one from Detroit and the other from Nashville. As they climbed higher and higher, they argue more and more about which of them is the most loyal to their particular hockey team. Seeing this, the St. Louis Blues fan walks to the edge and yells, “This is for hockey fans everywhere!”. He then pushes the fan from Detroit off the cliff. The City of Milwaukee is going to subvert the laws of nature by making Wells and State streets two way. Wells, located on the Marquette campus, has been one way forever. I never look eastbound when crossing, which means the next time I stagger out of Hegarty’s, I am going to get creamed. Thanks, Milwaukee. Anyone posting on the Internet bemoaning his or her absolute poverty should be properly mocked; that is to say, incessantly and loudly. Friends, were I in college today, odds are that I would not graduate. Instead, I’d probably be in jail for assaulting one or more dishonorable cretins, or be killed by a rabid mob of the same. As a columnist in the paper in my college days, I mocked many ideals, but never a death. Ani DiFanco? It’s just a typo, I know, because a later cell of the table (most important album from high school) spells her name right (while getting the name of her album Little Plastic Castles wrong). But jeez, it sort of proves the generational gap, wot, that they couldn’t tell at a glance the misspelling? Or perhaps I am the only one who straddles the generational gaps like a gymnastically-inclined squid. To celebrate, I switched from the AM oldies station today and put on some Vag Rock. I’m I am not a pretty girl…. that is not what I do…. I ain’t no damsel in distess….. and I don’t need to be rescued…. I know that United States forces in Iraq have played American rock and roll as a form of psychological warfare against the islamofascists. When confronted with taunts of against their manhood and Metallica, many Iraqis charged out like rabid animals and were quickly shot down. Imagine how much more madder and crazier they would have been if our guys played Ani DiFranco. If the decadence of American rock and roll offended them so, it could only be more effective to have a woman singing to them that she’s enthusiastically conflicted about sleeping with copious amounts of men and women. Remember, if Heather wins the IMAO T-Shirt Babe contest, there will be plenty of celebratory Guinness to go around. Remember to vote as though a Daley sent you. Today’s Google Search: i wish i never won powerball. Your humble narrator is currently the 36th hit. Remember, wish for what you have, and you’ll be happy. Or content, or perhaps blithe. Kudos to the Washington Post editor who entitled this op-ed column, which explains why we should not take to heart Kerry’s youthful indescretions when considering his fitness for leadership, “Prince Hal vs King Henry“. Message: John Kerry was born to be king! Who’s Not Their English Major? Say It! From Crescat Sententia we have a rebuttal of sorts to the list included here. Crescat lists its top 99 books/series of all time. Not so good, but it’s not a list of (sniff!) canon. The debate over Missouri’s growing methamphetamine problem took a major turn Wednesday, as police from around the state demanded that some common cold pills used to make the drug be classified as regulated narcotics available only at pharmacies. At issue is a chemical called pseudoephedrine. It’s an active ingredient in more than 80 over-the-counter remedies that are sold everywhere from gas stations to grocery stores. But pseudoephedrine also is a key ingredient in most recipes for meth, a powerful stimulant often called ice, crystal or crank. Missouri last year toughened existing regulations on how much pseudoephedrine a store could sell to an individual customer, and added new restrictions on where those cold pills could be displayed. As a result, meth cooks and their helpers now must shop at dozens of stores to get the thousands of pills needed to make even a few ounces of meth. Police at the summit said that without tougher regulations, the explosive increase in small meth labs will continue in Missouri and throughout the Midwest. Although most of the nation’s meth is made at a small number of large drug labs in Mexico and California, Missouri and the states it borders accounted for more than half of the meth-lab raids and related seizures last year. In other news, fire marshals demanded that lighters, matches, and magnifying glasses be sold only over the counter as they can be combined with an accellerant to intentionally start a fire, MADD is protesting against the availabilty of fruits and dandelions to young people, who can then ferment them and drink the contents, and the anti-gun lobby to restrict the sales of steel, lead, and wood. Legitimate purposes and rights are a threat to security. Just stand in your stall and bleat a little until its your turn, veal. The Bay Area’s sputtering economy has meant good news for San Francisco drivers, who have seen a drop in competition for the city’s notoriously scarce on-street parking spaces, but bad news for City Hall’s finance wizards who count on fines for illegal parking to help balance the budget. Unfortunately, building fines and excise taxes into the budget lead to this sort of problem. The government needs people to do proscribed things, or it needs to proscribe more things to keep spooning citizens’ money down its sucking maw. People might shriek over a property tax increase, or might vote down a sales tax hike, but who’s going to oppose raising a parking ticket fine? Until your dentist appointment runs over fifteen minutes, or you don’t know the lottery-style system of proper side-of-street parking (stay overnight in Milwaukee, eh?) and suddenly you’re paying $250. The silver lining, if you’re looking for something positive to say about profligate spending outpacing revenue: The anticipated shortfall is only $4 million dollars in the $352 million dollar deficit San Francisco’s running this year. Brock Sides of Signifying Nothing is a hat man. He even mentions Mr. Hats in Memphis, which is oddly enough where I purchased my current preferred black fedora. I’ve only been to Memphis twice, but the last time I was there–some six years ago (?!) I got my Dobbs. I would have gotten it at Donge’s, in Milwaukee, but they closed down seven years ago. A pity; I had gotten my first three fedoras there. I wear it winter or summer, to work and to play. 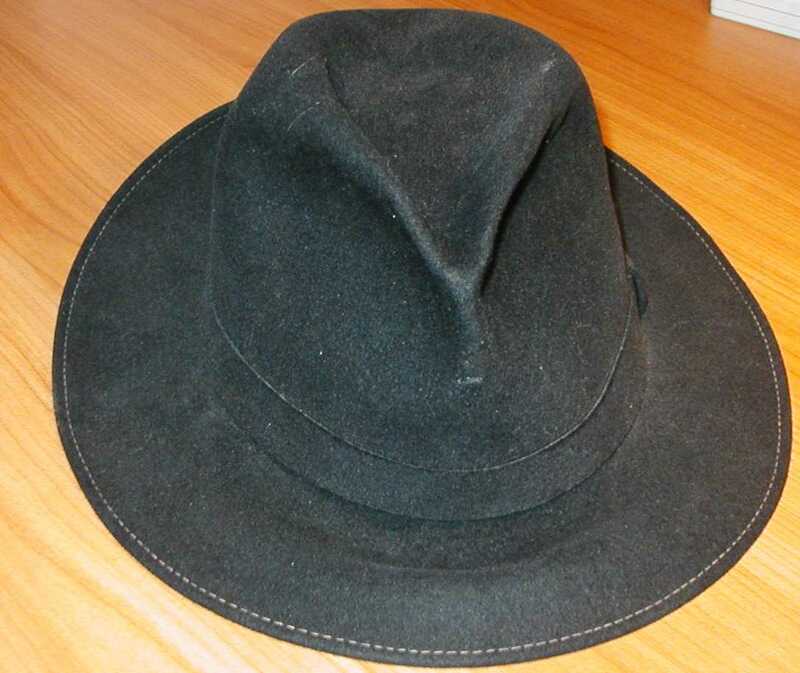 I’ve been wearing black fedoras for eleven years, since my years at college. Even today, should I bump into a Marquette alum of the same period, I might be recognized on the hat alone. It has the former owner’s initials in it, WJS. 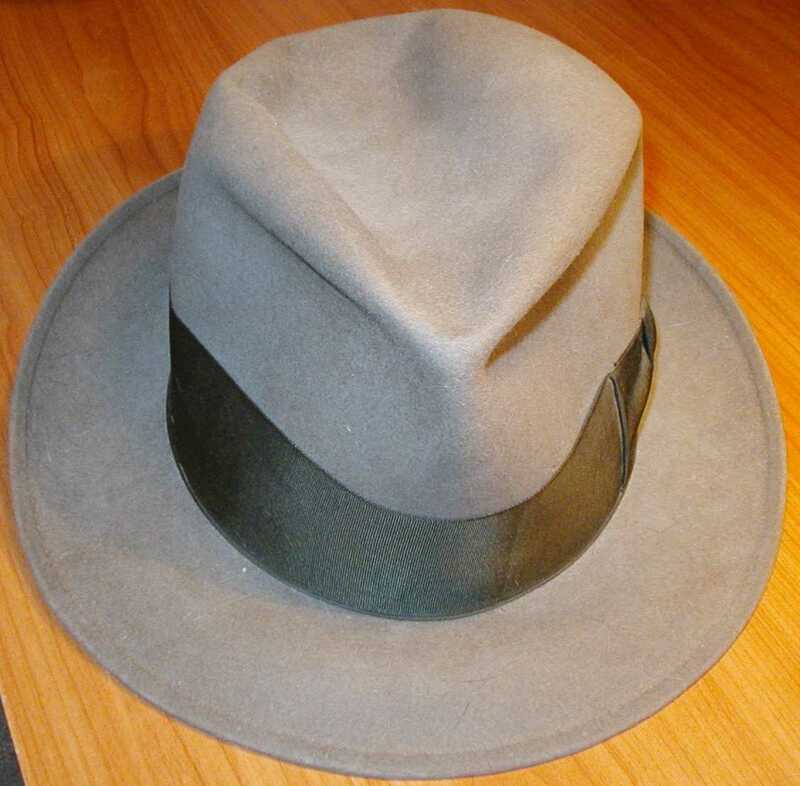 I tend to wear hats while writing (I wore a cheap straw Panama hat for my first novel and this brown fedora for my second novel). Heck, I’m wearing a ball cap now (Sydney Olympics 2000, given to me by a friend who got it from a real, live Australian!). 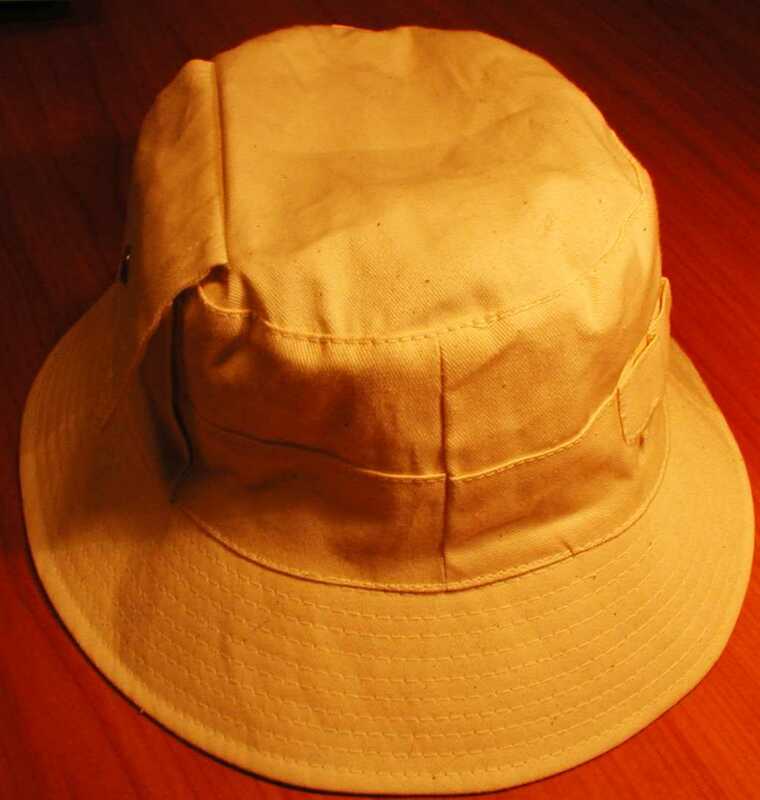 I wear it, and the Sydney ball cap, as I revise novel #2, blog, and open (and close) the various and sundry inchoate essays and novels that allow me to continue my dream of being a writer. MSN Dating offers this helpful article: 9 romantic gestures that’ll knock her socks off. Note to the relationship expert who titled this piece: Men are not trying to get women’s socks off. Let us men know when you get to more relevant garments. Remember all those times you couldn’t think of what to get those special someones on your gift-giving list? You thought they had everything? You were wrong. Odds are, that special person doesn’t have one of these Subversive Cross-Stitch creations. Hey, I am number 2 for the Google Search "searching for yourself on google". But who would search for that, using proper query syntax and all? Attention, journalists: I can be reached via e-mail at stlbrianj@hotmail.com. I am going to be FAMOUS now! In another attempt to save the consumer from himself, the Illinois Attorney General is cattle-prodding the Illinois legislature to the rescue. The St. Louis Post-Dispatch reports. When Michael Rogers drove out of a car dealership three years ago in his newly purchased GMC Jimmy, he thought he understood the financing arrangement. The interest rate the dealership gave him on the loan – 20.95 percent – sounded high, but the dealer had explained that Rogers’ checkered credit history had required it, and he’d accepted that explanation. After more than two years of paying $409 a month on the car, Rogers learned that he had actually been approved for a 9.25 percent loan from a lender. Unknown to Rogers, the dealership had then added the additional 11.7 percent itself, raising the final cost on the $17,000 car by almost $7,000. Aw, poor baby. You know, I got socked with a .9 percent financing rate in March, 2001. A year later, rates were 0 percent as car makers tried to ensure continued sales after September 11. So I feel your pain, pinhead. 21% on a car? Jesus H. Gonzalez, but that’s a damn high rate to pay. Come to think of it, $17,000 is a lot to pay for a vehicle, especially at 21% interest. It took me almost four years to run my credit cards up to that amount, but that included a night at a “Fantasy Suite” establishment which included an in-room swimming pool, sauna, waterfall, and complimentary bottle of champagne. A lot to spend for one person, but at least it wasn’t $17,000. What’s my point? Oh, yeah, you, Joe Stupid Consumer, are an IDIOT to spend that much on a car at that rate of interest and assume it’s the best rate without shopping around. Fortunately, the Daley State will come to your aid and will straitjacket business because you, the consumer, are mad. Attorney General Lisa Madigan is pushing legislation that would require car dealers to tell customers how much of their car loan interest rate was determined by the lender, and how much the dealer has added on to it. Thank heavens! The Illinois Government to the rescue! The markup system is common in auto financing nationwide, including in Missouri. Lawmakers in Missouri are not considering any legislation to require disclosure of the actual loan rate. The Post-Dispatch ruefully reports this, because it’s on the side of the working man in every contest wherein the reigning champion isn’t the newspaper industry. One dealer promised to get a car buyer the “best” rate for a loan. The dealer offered the customer a loan at 16.95 percent interest. It turned out that the dealer was secretly paying 14.95 percent interest to a lender and pocketing the difference. All right, your crackhead investigative journalism has probably uncovered a dealer offering a deal to a subprime customer, wherein the dealer says the “best” rate, and probably means the “best” in the sense of the best in which the dealer would offer. Come on, PD, you don’t hammer advertiser Anheuser Busch in any advertisement wherein it proclaims any superlatives, particularly those including taste–so why come down hard on the poor SOB auto dealer who has bought a corner lot and a couple junkers in a throw at the American Dream? I have sympathy for the business in this case because 1.) it’s someone taking a shot at making money, and 2.) it entered the contract with its eyes open, unlike the less-than-savvy consumers you defend. But the intelligent don’t need government, or crusading “journalism,” protection. They understand the free, voluntary exchange in any business transaction. We’d also prefer you not pollute the swimming pool with more legislation and regulation, thanks.